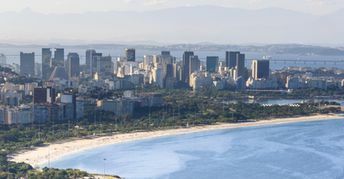 This beach ranks #6 of the "Best beaches in Rio de Janeiro"
The hotels are cheapest in the coastal zone of the Rio (only favelas are cheaper). However, it's not safe here at night. But during the daytime, feel free to use underground trains to get to Copacabana or Ipanema beaches. Fly to Rio de Janeiro International Airport (GIG). Next hire a taxi. Never catch a taxi on the street! You may just go to the nearest cafe or hotel, and ask to call a taxi for you. The best time for a beach holiday in Rio de Janeiro is a warm period from October to April.